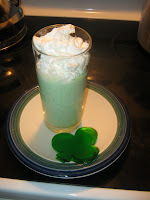 St. Patrick's Day is traditionally a wear green, eat green food, and drink green beer kind of day. Green eggs and ham just sound wrong to me (and I'm not really a beer person), so I came up with some kid friendly ideas instead. Last year, the boys had green shamrock pancakes for breakfast, which were at best vaguely shamrock shaped. Lunch was a chocolate gold coin hidden under their sandwich. This year, it's just lunch with sandwiches, green peppers, and sucker shamrock napkin holders. 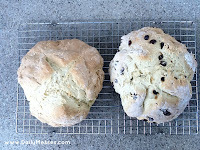 For dinner, I'm planning on making beef stew and Irish Soda Bread (see recipes below). I don't know yet what dessert will be, but some ideas are Rainbow Cupcakes, green shakes, or green shamrock shaped Jello Jigglers. To make a lollipop shamrock, tie 3 green Tootsie Pops (or other round green wrapper suckers) together. After I tied them together, I wrapped with green ribbon to make a stem. 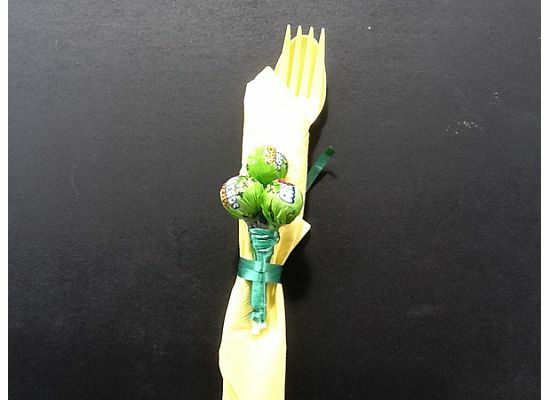 I then tied them around a napkin/silverware with extra green ribbon. BEEF STEW: prep time 15 min, cook time 2 hours. Serves 6. 1. In a pot, brown the beef in oil. Drain off fat. 2. Add water, bay leaves, salt and pepper. Bring to boiling; reduce heat; simmer covered 1 hour. 3. Add potatoes, carrots, onions. Simmer 45-55 minutes more, or until beef and vegetables are tender. 5. Stir in enough instant potatoes to thicken to desired consistency. 6. Add parsley and serve. IRISH SODA BREAD: prep time 15 min, cook time 45 min. Tip: Tastes best when you make the morning of or the day before you eat it. 2. In a large bowl, stir dry ingredients with a whisk. 3. Add 1 cup buttermilk. Combine flour mix and buttermilk with a fork, gradually add rest of milk until a soft dough is formed. Optional: Mix in 1 cup raisins to dough before baking. 4. Knead on light floured surface (or even in the bowl) for 1 minute. Form dough into a slightly flattened circle. 5. Place dough on a parchment lined cookie sheet. In the middle of the bread make a 1/2 inch deep X with a sharp knife. 6. Bake 40-45 minutes. Bread is ready when it sounds hollow when tapped on the bottom.